What kinds of things are you going to catch?What lives with the scallops? These questions were also quite common before I boarded the Hugh R. Sharp. I’d like to introduce you to some of the species that are included in the dredge with the scallops (or sometimes, instead of the scallops). All of these are termed “bycatch” and are counted and/or measured and then thrown back.As before, pictures of most of the species will be added when I am back on land. In this log, I will talk about the fishes that are often in the dredge. Most of this information came from Bigelow and Schroeder’s Fishes of the Gulf of Maine, edited by Collette and Klein-MacPhee, 3rd Edition (2002). Flounder – Flounder are a flat fish with both eyes on the same side of the fish when they are adult. As young, they eyes are on both sides, as in most fish, but as they mature, one eye migrates to the opposite side and the fish lays flat. In general, they are a mottled brown to blend in with the ocean bottom. 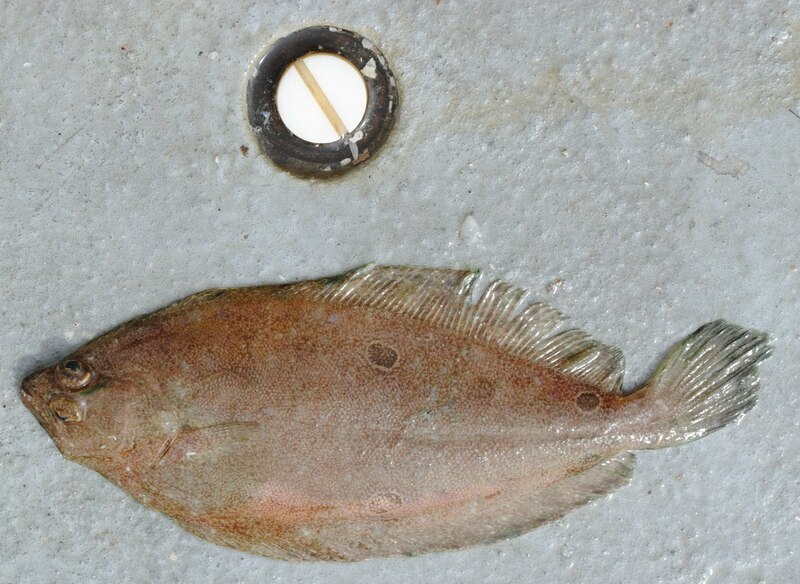 Fourspot Flounder (Paralichthys oblongus) – have four distinct spots on the dorsal side: 2 near the tail and 2 in the middle, above and below the lateral line. They eat cephalopods (squid and octopus), crustaceans, and other fish. Predators include spiny dogfish, goosefish (see below), silver hake (see below), and other flounder. Windowpane Flounder (Scopthalmus aquosus) – more round than other flounder. They can reach a maximum size of 51cm and weigh more than 1 kg, but average between 25-30 cm in length. They eat decapods (shrimp) and other fishes. Predators include sharks, skates (see below), cod, and dogfish. 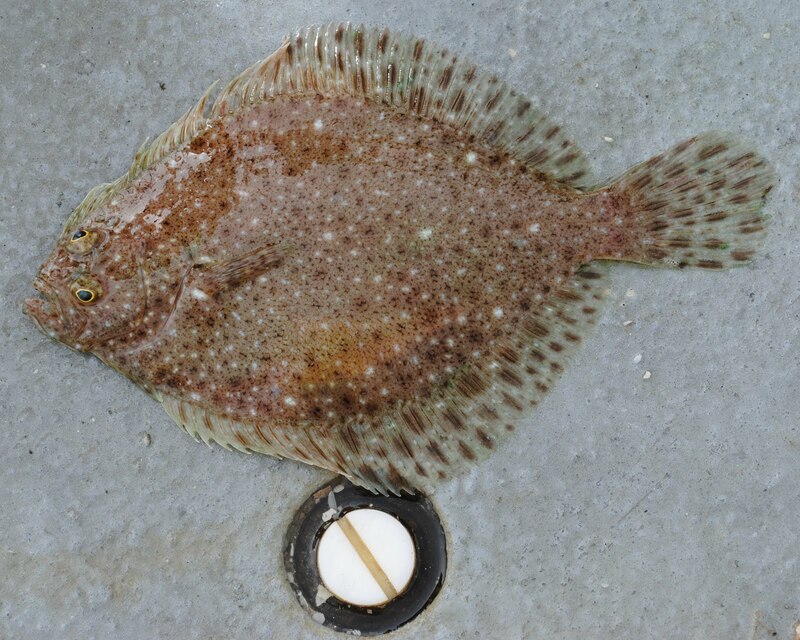 Windowpane flounder are not considered commercially important, but have been used as an indicator species in Long Island Sound. Summer Flounder (Paralichthys dentatus) – have highly variable color patterns that they can actually alter for camouflage. They don’t replicate the ocean floor underneath, but change their patterning to blend in with the substrate. Males can reach 61cm and 2.6 kg while females can reach 94 cm and 13.4 kg. They average 40-56 cm and 1-2.3 kg with females generally being larger and heavier for their age than males. 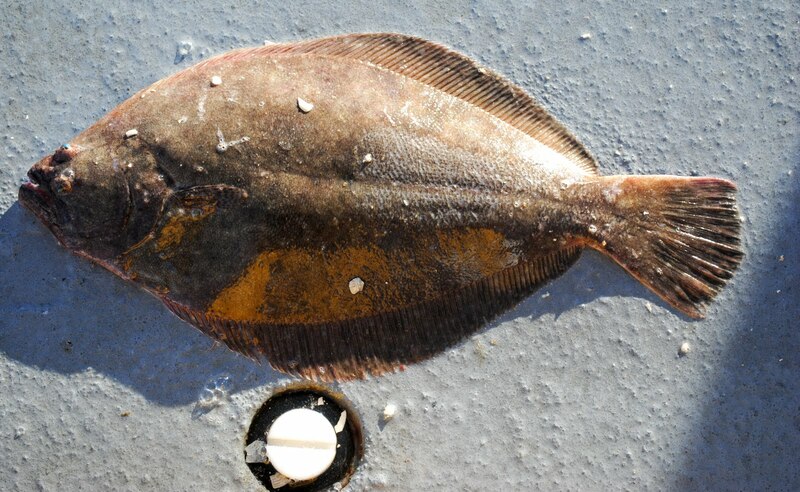 Summer flounder eat other fishes (including other flounder), cephalopods, and crustaceans. 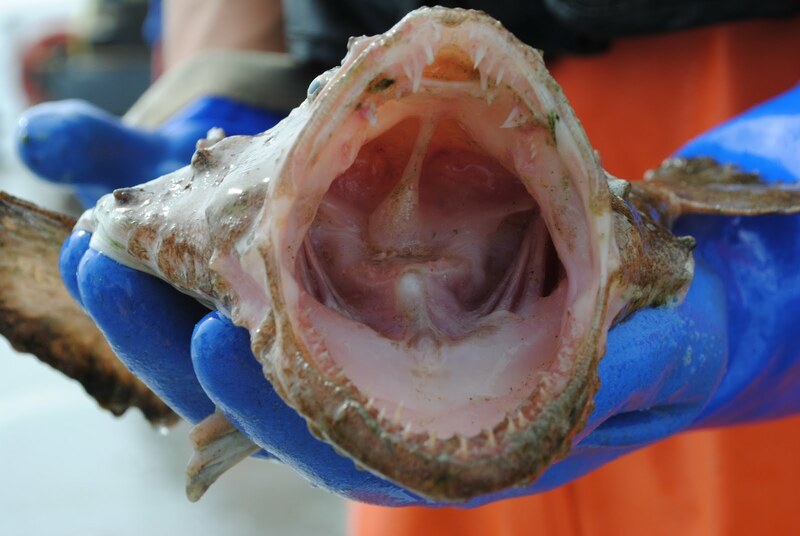 Predators include sharks, skates, cod, goosefish, silver hake, etc. 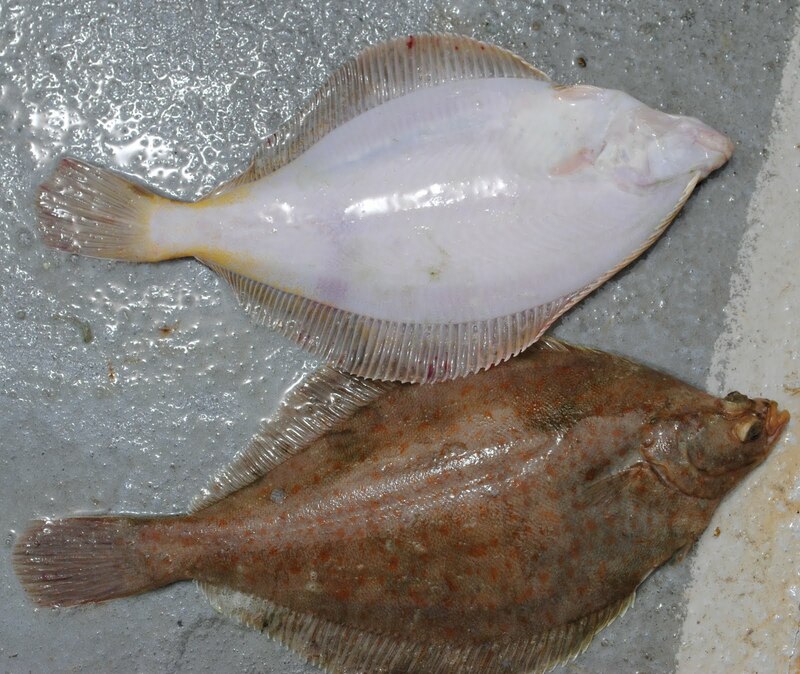 Commercially, summer flounder are one of the most important flat fish in the north Atlantic. Commercial aquaculture of summer flounder began in 1996. Yellowtail Flounder (Limanda ferruginea) – more evenly pigmented than other flounders and have yellow streaks on the ventral edges near the tail. Males reach an average size of 40 cm and females reach 46 cm. They eat cnidarians, crabs, bivalve mollusks, echinoderms, and other flounder. Their predators include spiny dogfish, skates, goosefish, hakes, halibut, and four spot flounder. Yellowtail founder are one of the most commercially import flat fish in the area. By the late 1990s, they were considered to be fully exploited and rebuilding local stocks. Goosefish or Monk fish (Lophius americanus) – is a type of angler fish. Angler fish use a lure to attract prey fish nearer the mouth of the predator. Goosefish have a mouth that is enormous for the size of the fish and which opens upward. The teeth are plentiful and all point back into the mouth so that in trying to escape, the prey simply impales itself more tightly onto the teeth. It also has spines on the dorsal side of the head. There are confirmed incidences of goosefish eating diving birds, but stories of them eating geese are probably apocryphal. Goosefish can reach 120 cm in length and 27 kg in weight. They eat bony fishes, cephalopods, elasmobranchs, and occasionally birds. Not much eats goosefish, though smaller ones are eaten by larger goosefish, sharks, and swordfish. . There is a commercial market for monkfish, Julia Childs is often credited with making it popular with a recipe she did on one of her shows. 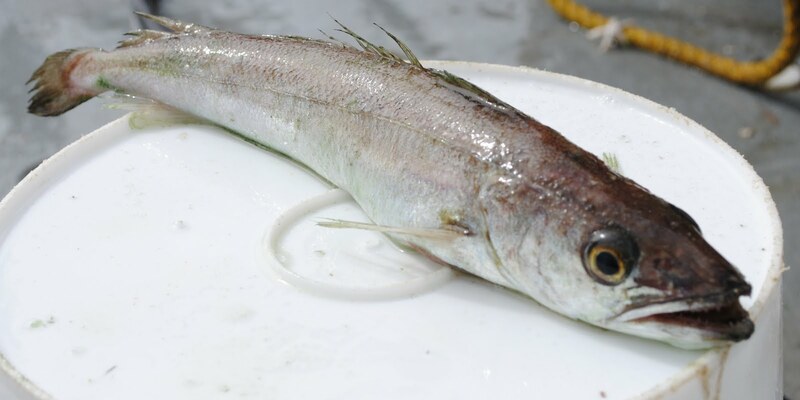 Red Hake (Urophycis chuss) – are silvery fish with a reddish tint on the head, very similar to the picture below. They can grow to 50 cm and 2 kg with the females being generally larger than the males. They eat decapods, polychaetes (sea mice), crustaceans, and other fishes. Their predators include dogfish, cod, goosefish, and silver hake. Commercially, they are used in animal feed and larger ones are used for human consumption. They are considered underexploited. Silver Hake (Merluccius blinearis) – are silvery fish that are generally a darker grey than the red hake. They can be larger than the red hake, up to 76 cm and 2.3 kg. They eat other silver hake, crustaceans, and other fishes. Many other fishes as well as harbor porpoises consider the silver hake to be prey. Commercially, they are used as fresh fish, canned pet food, fertilizer, and fish meal. They are unsuited to freezing. Silver hake are considered fully exploited. 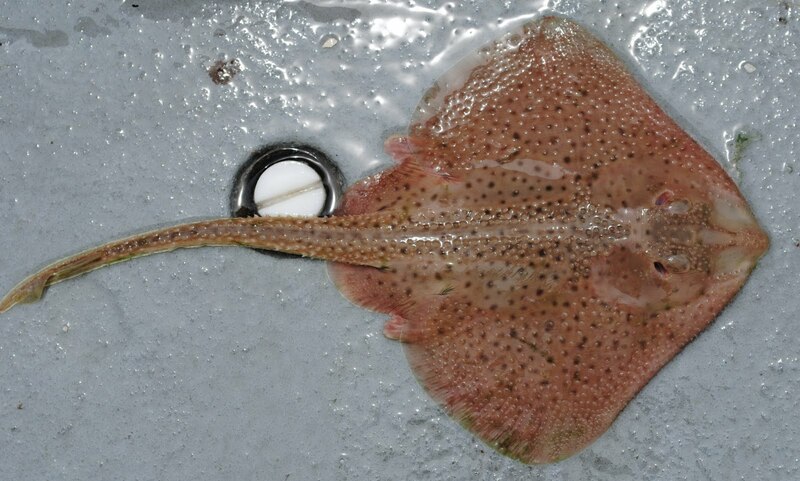 Little Skate (Leucoraja erinacea) – are trapezoidal, purplish brown and spotted on the dorsal side. They also have thorns present on the dorsal side. Little skate females release a single, fertilized egg in a distinctively shaped egg case. They reach a maximum length of 54 cm and eat fish and invertebrates, including gastropods, bivalve mollusks, crabs, etc. They are eaten by sharks, other skates, goosefish, and seals. Commercially, little skates are used to bait lobster traps. 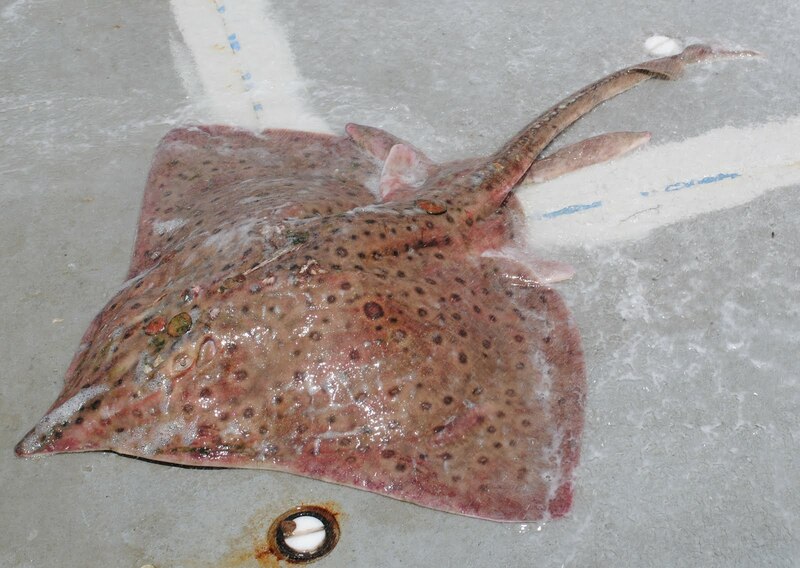 Barndoor Skate (Dipturus laevis) – are one of the largest skates in the area. They can reach 180 cm and over 10 kg. They eat invertebrates and fishes, including gastropods, crabs, lobsters, and polychaetes. They do not have many predators, though they are probably eaten by sharks. Ocean Pout (Zoarces americanus) – look much like an eel with fins just behind the head. They are a yellow-green/brown with patterning on the dorsal side. They can grow to 118 cm long and more than 6 kg in weight, though the average is 40-71 cm and 0.45-1.8 kg. They eat shelled mollusks, echinoderms, and some fishes. Predators of the pout include dogfish, skates, cod, hakes, and sea ravens. Commercially, the pout was heavily marketed during World War 2. This ended when there was an outbreak of a parasitic infection in the pout resulting in an embargo on human consumption of the pout. By the late 1990s, the population was considered to be overexploited and to have low biomass. 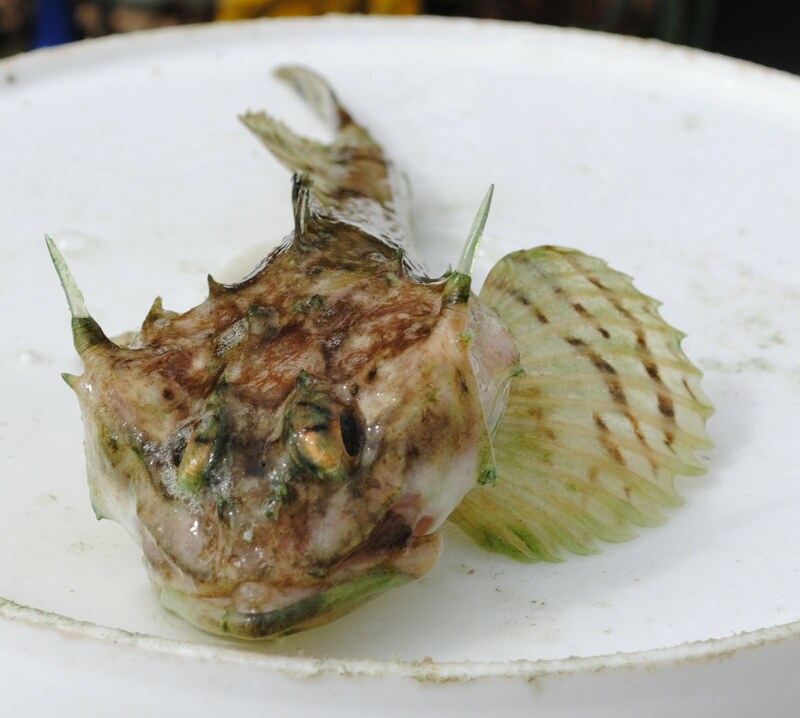 Longhorn Sculpin (Myoxocephalus octodecemspinosus) – are greenish brown with distinct markings. They almost look armored. Large fins extend from just behind the head. Their maximum size is 45 cm but the average size is 25-35 cm. Longhorn sculpin eat shrimp, crabs, worms, mussels, mollusks, squid, fishes, etc. 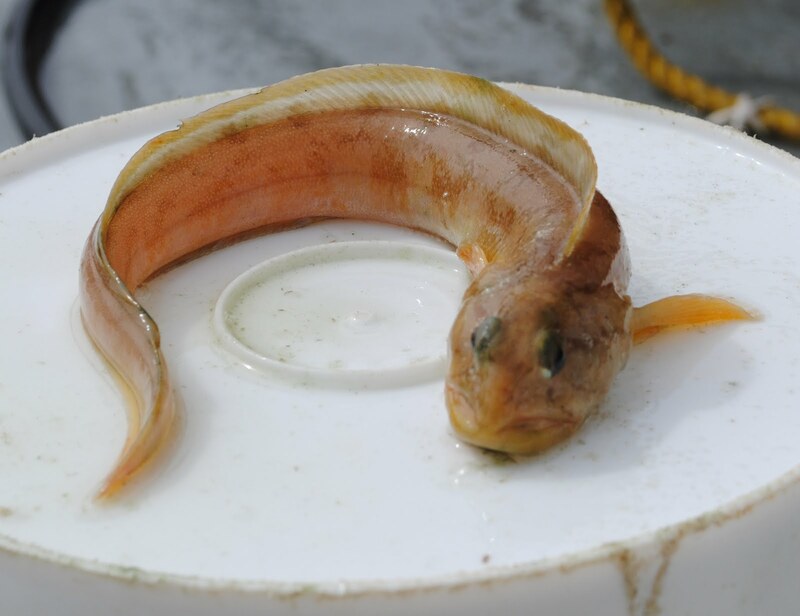 They are eaten by cod, spiny dogfish, skates, sea ravens, goosefish, and other sculpin. There is not currently any commercial importance. Again, we were sorting and counting in the rain today. There was less wind with this storm than the last, for which I am grateful. I have also finally learned some of the tricks to shucking scallops more efficiently. Since my raingear is cuffed at both the sleeves and the pants, I have to remember to empty the water out of the cuffs before going back inside to take the gear off. During the shift, gear is left with the pants down around the boots so it is easy to get in and out of for each tow, up to 12 or more times per shift. The science crew works noon to midnight or midnight to noon while the ship’s crew works from six to six. Because of the different schedules, traditional foods for particular meals don’t happen. I am on the noon to midnight shift (day watch) and so start the day by eating lunch. Our lunch is ship’s dinner (steaks last night) and our dinner is leftovers from the kitchen, which are quite good. There are always several types of salads and one or, sometimes, two choices for a main course. Additionally, there is the candy drawer and the ice cream freezer! No one will starve out here.